Earl's Court is a London Underground station on the District and Piccadilly lines. The station is in both fare zones 1 and 2. The station is located in the Earl's Court area of central London, with the eastern entrance on Earl's Court Road and the western entrance on Warwick Road (both part of A3220). It is a step-free tube station; Earls Court Road entrance provides lift access between street and platform. On the Piccadilly line the station is between Barons Court and Gloucester Road. 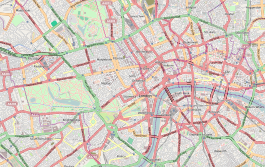 It is the major junction of the District line, with West Brompton, Kensington (Olympia) and West Kensington to the west, High Street Kensington to the north and Gloucester Road to the east. The Earl's Court train crew depot is situated within the station buildings towards the Warwick Road side of the station; it includes booking-on point, mess room and canteen facilities. There are train stabling roads below nearby Hogart Road. Since 1951, the station name has been spelt with an apostrophe on the tube map although the name of the local area is generally spelt without. Prior to 1951 tube and rail maps generally show the station name without the apostrophe and on the station buildings the name has variously appeared with and without the apostrophe. The name of the local area has always been shown with an apostrophe on Ordnance Survey maps, and also by A-Z, but other mapmakers do not use one. Some[who?] wonder if there is a reason why the apostrophe is used for Earl's Court station but not for the nearby Barons Court. [better source needed] William Palliser developed the Barons Court estate. A book in the Society of Genealogists, annotated in pencil by R. Burnet Morris who knew Sir William personally, provides a history of the area. Morris declared Barons Court was named "after Sir William's Irish Estates", Baronscourt. As a result, unlike its neighbouring station, Earl's Court, it is not written with an apostrophe. On 12 April 1869, the District Railway (DR, now the District line) opened tracks through Earl's Court as part of a south-westward extension from its station at Gloucester Road to West Brompton where the DR opened an interchange with the West London Extension Joint Railway (WLEJR, now the West London Line). At its opening, the extension had no intermediate station. On 3 July 1871 the DR opened a northward link from the West Brompton branch which connected to the Inner Circle (now the Circle line) south of High Street Kensington. Local residents near Earl's Court lodged a petition against the DR to build a station, which opened that October. 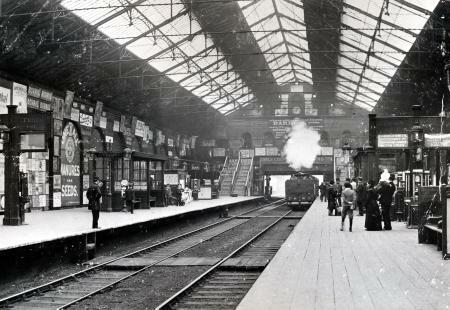 The original station was a simple wooden booking office. 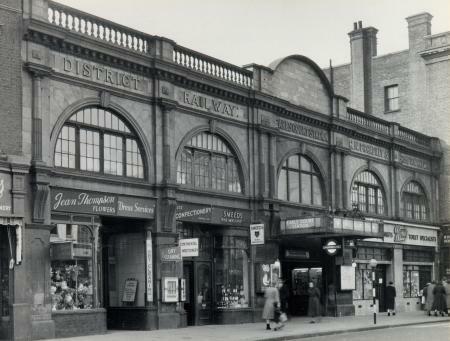 The original station was on the east side of Earls Court Road rather than the west. On 1 February 1872, the DR opened a northbound branch west of Earl's Court station to the WLEJR which it connected to at Addison Road (now Kensington Olympia). From that date the "Outer Circle" service began running over the DR's tracks. The service was run by the North London Railway (NLR) from its terminus at Broad Street (now demolished) in the City of London via the North London Line to Willesden Junction, then the West London Line to Addison Road and the DR to Mansion House — at that time the eastern terminus of the DR.
From 1 August 1872, the "Middle Circle" service also began operations through Earl's Court running from Moorgate along the Metropolitan Railway's (MR's) tracks on the north side of the Inner Circle to Paddington then over the Hammersmith & City Railway (H&CR) track to Latimer Road then, via a now demolished link, to the West London Line to Addison Road and the DR to Mansion House. The service was operated jointly by the H&CR and the DR.
On 9 September 1874 another extension was opened which took the DR west from Earl's Court to West Kensington and Hammersmith. Trains from Earl's Court could then travel via five different routes and the station's efficient operation was central to the DR's success. Unfortunately, the location of the station close to the eastern junction meant that the original station was congested. A fire on 30 November 1875 damaged the station and a more substantial replacement was built to the west of Earls Court Road. It was opened on 1 February 1878. On 5 May 1878, The Midland Railway began running a circuitous service known as the "Super Outer Circle" from St Pancras to Earl's Court via Cricklewood and South Acton. It operated over a now disused connection between the NLR and the London and South Western Railway's branch to Richmond (now part of the District line). The service was not a success and was ended on 30 September 1880. By the start of the 20th century competition from buses and the new electric trams was eroding passenger numbers and to make itself more competitive the DR began planning for the electrification of its services. An experimental service was operated for six months in 1900 when electric trains were tested over the section of track between Earl's Court and High Street Kensington. Following protracted negotiations with the MR over the method of electrification to be used the first electrified section of the DR was opened in 1903. Electric services through Earl's Court were begun on 1 July 1905. The first decade of the 20th century saw other developments at Earl's Court station. On 30 June 1900 The Middle Circle service was withdrawn east of Earl's Court which became the terminus of the service until 31 January 1905 when the service was cut back again to terminate at Addison Road. On 15 December 1906, the Great Northern, Piccadilly and Brompton Railway (GNP&BR, now the Piccadilly line) opened between Hammersmith and Finsbury Park serving Earl's Court from platforms in deep tube tunnels constructed beneath the surface station. Unlike at Gloucester Road and South Kensington, other stations served by both the District and Piccadilly lines, a new building to house the lifts to the deep level platforms was not required. Instead space was provided within the existing station shed, near Earls Court Road, and the lifts descended directly to platform level without the need for intermediate stairs below ground. 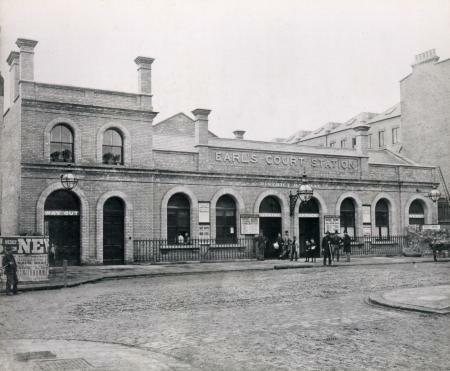 On 31 December 1908, Earl's Court became the terminus of the Outer Circle service when services east of the station to Mansion House ended. By this date the service was operated by the London and North Western Railway (LNWR, successor to the NLR). It was reduced again in 1912 to a shuttle service operating between Willesden Junction and Earl's Court only. 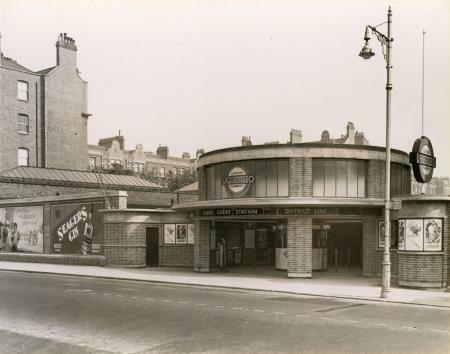 A new station building on Earls Court Road was constructed to a design by Harry Ford in 1915. The Warwick Road entrance was rebuilt in between 1936 and 1937 in the modern brick and glass style being employed by London Underground at the time. During World War II, bomb damage to the West London Line caused the closure of the line and the Willesden to Earl's Court shuttle last ran on 2 October 1940. The section to Kensington (Olympia) was reopened on 19 December 1946 but ran only when exhibitions were open at Olympia. An additional glass rotunda was built on top of the Warwick Court entrance in the 1960s to house the station's operation room. Between 1986 and 2011, the Kensington (Olympia) service was operated full-time throughout the week, running regardless of whether an exhibition was open. From December 2011 onwards, it reverted to operating only during exhibitions. In the 1990s additional lifts for the mobility impaired were added from the District line platforms to a new overbridge which was connected to the high level walkway which joins the two station entrances. In November 2007, the station began undergoing further construction to repair the roof. From 17 December 2008 the scaffolding for the repaired roof has been removed and the platform restored to its original state. The station is 'Grade II' listed as being of architectural and historical interest. At the 2009 National Railway Heritage Awards the reconstruction of the station's train shed roof gained a certificate of merit for the quality of the work carried out. Earl's Court is a hub for several routes on the District line and Piccadilly line. On each platform is a "next train" indicator board with various routes, highlighted with an arrow pointing to the next one. 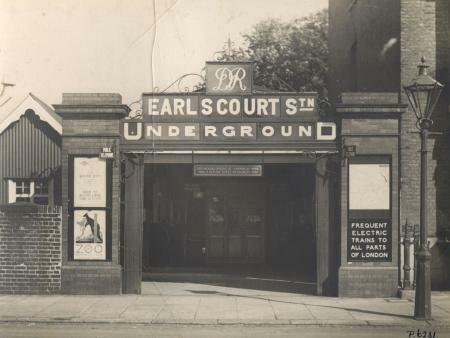 Unlike many other Underground stations that feature modern electronic boards, Earl's Court has retained the mechanical board because of its Grade II listed status. London Buses routes 74, 328, 430, C1 and C3 and night routes N31, N74 and N97 serve the station. District line platforms in 1999. Note the crowded staircase behind the train. ^ Locker, Tom (9 November 2011). "Just For My Boys: London 1994 - Incident on the "Tube"". justformyboys.blogspot.com. Retrieved 13 April 2018. ^ Day & Reed 2010, p. 24. ^ Day & Reed 2010, p. 25. ^ Wolmar 2012, p. 80. ^ Davies & Grant 1983, p. 85. ^ Day & Reed 2010, p. 26. ^ Horne 2006, p. 18. ^ Lee 1956, p. 29. ^ Horne 2007, p. 19. ^ "Walking stick belonging to William 'Bumper' Harris, 1913". London Transport Museum. Retrieved 5 June 2014. ^ "The Kensington Canal, railways and related developments - British History Online". www.british-history.ac.uk. Retrieved 13 April 2018. ^ Davies & Grant 1983, p. 120. ^ "Latimer Road – Uxbridge Road and Single Line to Olympia" (PDF). London Underground Railway Society. Retrieved 6 April 2019. ^ Kensington Olympia Exhibition Centre travel (PDF) (Report). Transport for London. September 2013. p. 3. Retrieved 9 April 2019. ^ "Media". Transport for London. Retrieved 13 April 2018. ^ Martin 2012, p. 79. Davies, R; Grant, M. D. (1983). London and its railways. David & Charles. ISBN 0-7153-8107-5. Horne, Mike (2007). The Piccadilly Line. Capital Transport=isbn=978-1-85414-305-1. Jackson, Alan (1986). London's Metropolitan Railway. David & Charles. ISBN 978-0-715-38839-6. Martin, Andrew (2012). Underground, Overground: A Passenger's History of the Tube. Profile Books. ISBN 978-1-847-65807-4. Wolmar, Christian (2012) . The Subterranean Railway. Atlantic Books. ISBN 978-0-857-89069-6. Wikimedia Commons has media related to Earl's Court tube station. 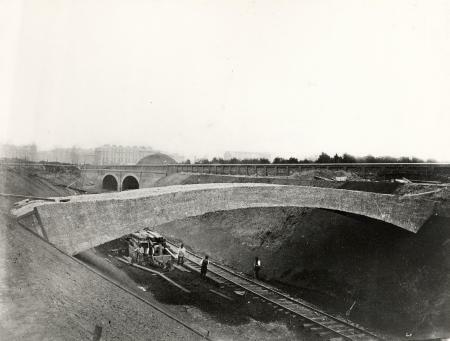 Future site of Earl's Court station during construction of West Brompton extension, 1867. 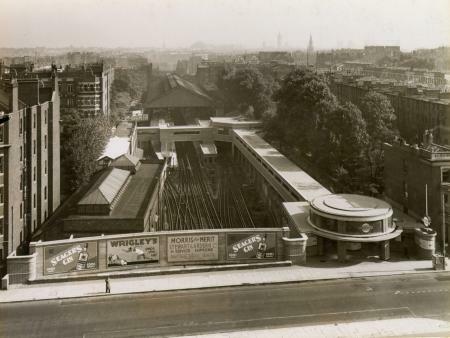 Glass roof of Gloucester Road station is visible in distance.